42.3508002 W 71.062206 W is Boston, from Sept 20, 2000. JD 2441438.5104 = Julain date, comes out to 4/30/1972, at 13:25:04, or 1:25pm. it ought to be lived. Therefore it is essential that we understand these mysteries. The Box is most likely a safety deposit box, mentioned on pages like May 1, 1992. So... 'the hell happened on October 24 90? clue:  Look, here is a direct reference to a quadrant, think 12 and 3.
through a massive data crunch ...yummy. http://aa.usno.navy.mil/data/docs/JulianDate.html I get a date of May 1, 1972, which seems to make sense. Does anyone else? enormously complicated stuff is connected. I no longer believe they use filler. some message the webmaster is sending?_  While you're at it what does the Hebrew mean? hance: no message, trust me, i probably just screwed it up. are silly in the head and never crack these if they are using poetic metre. I can't read the Hebrew so there is no way to start looking. Re: what the hell happened on October 24 90? "The last transmission of Capt. Morgan contains a THIRD LEVEL ANOMALLY; unless visual confirmation can be made prior to the Winter Tour, it must be assumed ' Erruht im Felndesland.'" Obviously, their communications were breached, and re-arragements were necessary. Has Captain Morgan been referred to since then? I'd have said 12 midday since 0 hours is mentioned). Could that be the date that the first ad was placed? 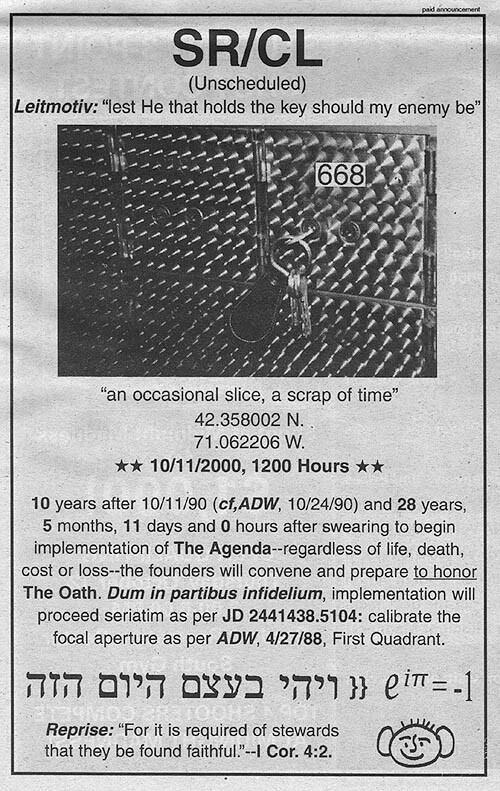 clue:  The Hebrew appears to be Exodus 12:51- "And on that selfsame day..."
The hidden message in this ad is found by taking every fifth character and space. Then droping the numbers. thoughts that go not to p nolle AHCPR altar if you wish qa t.
So, agian roughly "We spent years planning this don't change them on your whim nolle." Isn't Captian Morgan a refrence to Captian William Morgan the famous Freemason? Could it then mean that the infiltrator was a Mason? Is this a warning about the Masons? Maybe to the Masons? It suddenly pops up my mind that 1572 was the horribly famous date of the massacre of St Barthelemy in France where Protestants have been slaughterd by catholics in the streets of Paris. Then 1572 can be read as 1/5/72 the day they swear "to begin the implementation of the Agenda--&c."
Just to add a grain of sand.